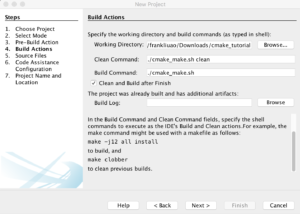 How to work with CMake and Netbeans (8.2 or newer) on OS X | Ao's labs of everything! 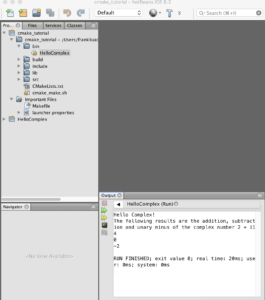 After an exhausting search for a good IDE for C++, I finally stopped at Netbeans. I appreciate its convenient zoom-in/out feature, auto-completion, user-friendly interface, etc. 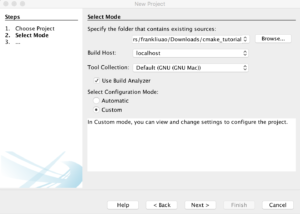 The first challenge I met was to set up the project to work with CMake, as I decided to think beyond the GNU make. 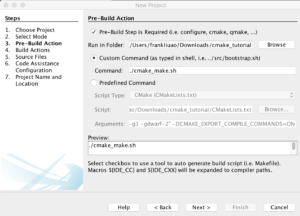 I use a MacBook, therefore many programmer tools have to be “manually” installed, including CMake. 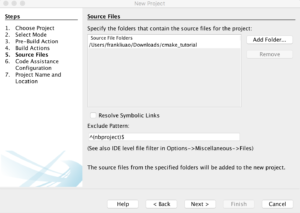 In this journal, I’ll demonstrate how to set up a project in Netbeans to work with CMake on Mac OS X. This will give you the version number of your CMake. Test tree program by just typing tree in the prompt and it will give you a hierarchy of the current folder. Now you are ready to go. 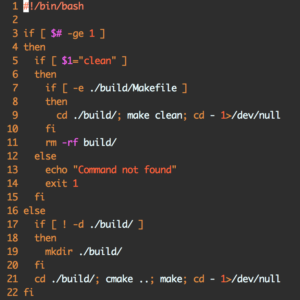 The shell script will first look for an existing ./build/Makefile and do the designated make clean process. Thereafter, the ./build/ directory is completely removed, and an empty ./build/ is created for the new build. Click on Next, then choose the root folder, such as below. Choose the modified GNU Mac. Choose Custom Configuration mode. Check the box on Pre-build step is required, and choose the root folder to run in. Use the custom command in shell to do the build. In our case, it’s just ./cmake_make.sh Be sure to change the accessibility to make it executable. Hit Next, and then use the root directory as the working directory. 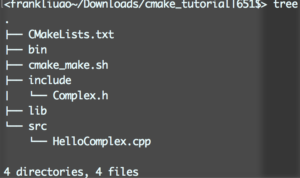 Change the Clean Command and Build Command to ./cmake_make.sh clean and ./cmake_make.sh . Check the box for clean and build after finish. Click on Next again, choose the source file location, which is the root directory in our case. Click on Next, and choose Automatic Configuration (No figure for this step). The final step will be automatically completed by the software. Click on Finish, then the shell script will be executed automatically, as it was specified as the command to build the program. The following workstation should now be available, and the first pre-build should be done also. 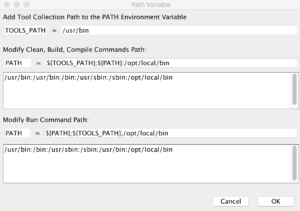 You may run the executable in the ./bin/ directory in NetBeans, the output will be shown in the window. 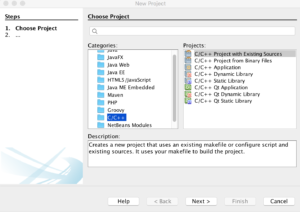 This blog only describes how to start the NetBeans project from existing files, but does not include the details of CMake and C++ codes being used. 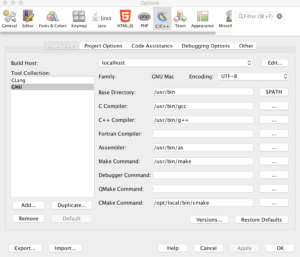 If you are interested, please read my other blog on CMake. You should be able to click on Run from now on. Work on the source files including headers, re-build, and run! Please leave them in the comments below. I’ll try to improve my blogs. Thanks!